Favor boxes are used to present gifts to the guests at a party or wedding function. Small amount of food or sweets are loaded into these boxes and then presented to the guests. Some of the guests eat the dessert at the function and some keep them for later use and bring them home. Suitcase Favor box is one of the best thing to distribute among guests because with your personalized message on the boxes with maybe picture of your wedding will keep reminding the visitors of great experience they had at your function. 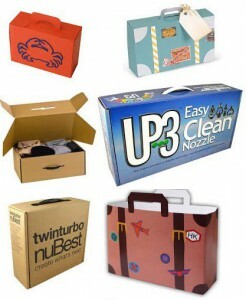 Suitcase favor box comes in different sizes, it depends on the amount of things you want to put inside these boxes. Some birthday parties distribute lots of things among visitors so the size of the box should be big enough to handle those items. For example, to put things like, T-shirt with your personalized message, mug with your message, pens, caps and other party things, you will need a suitcase box of about 10″x8″x3″ so that these things fit inside the box easily. These boxes usually have white or clear plastic handle on one end to carry it easily. These suitcase favor boxes opens from the top like a pizza box and the side walls are re-enforced for extra strength. 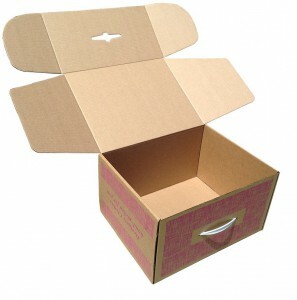 These suitcase boxes ships flat and are die cut and scored along the folding lines for easy folding. These boxes can be easily constructed by folding the scored fold-lines. To assemble these boxes, first step is to fold the all score lines once so that when construction begins, the fold lines easily bends. Now first stop is the fold the side flaps within itself. To do that hold the front and back panel and then start folding the left double folding flaps. Make sure these flaps fold over the side dust flaps nicely. Similarly fold the double-fold right flap over the side dust flaps. After folding the side wall flaps, make sure they tucks in at the bottom small slots for locking. Now you have the base of the box ready. Just load your product in and tuck fold the top lid to close the box. The handle of the box will goes through the front lip of the box and through the top lid flaps. ← Custom Gable Boxes – Perfect Presentation for Your Product!